What is the Best Kind of Roof for Florida? 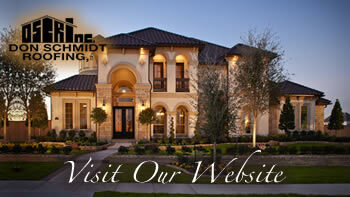 Home » Don Schmidt Roofing Blog » What is the Best Kind of Roof for Florida? What is the best roof for your Florida home? If you own a home in Florida, you know how hard the weather, heat and sun are on roofing materials. Here are the most popular types of roofing materials and some pros and cons of their use in Florida. Composition Shingles: Composition shingles are affordable, and the typical roofing materials for a large part of the country. They are made from asphalt or fiberglass and are a clean looking shingle. They are also durable and available in many colors. The problem with using them in Florida is that they easily blow off in high winds and scar in hot weather. Clay Tile: Clay tile is popular in Florida. It fits with a lot of the southwestern home design style. This type of tile has a long-life span, may require some cleaning, but not a lot of maintenance and is very resistant to rot and insects. It also won’t burn. The biggest problem is that a clay tile roof is heavy and may require extra roofing support. Another drawback is that the tiles are fragile and can break if walked on. Slate tiles have the same pros and cons. Concrete Tile: Concrete tiles are newer on the scene and can simulate wood shakes or other types of tiles. Concrete tiles are durable and low maintenance. They are resistant to rot, mold and insects. They are also much lighter than clay or slate tiles but can give you the same appearance. The problems with them as roofing materials, though, are that they are expensive and have had problems with the material curling, breaking and changing color. Metal Roofs: Metal roofs have previously been made of zinc, copper or lead, but today are generally made of steel. Metal roofs can also be made to resemble wood shakes, clay tiles, shingles, and Victorian metal tiles. This type of roof is durable and just about maintenance free. They also reflect heat and sunlight away from the home, which keeps the home cooler and more efficient. It is very expensive, so if you aren’t planning on being in your Florida home for decades, it may not be an economical choice.